It is half term this week but the weather has been awful. We had a trip to Irchester Country Park on Wednesday. We managed to have a long walk through the woods and have a picnic before the rain started. Unfortunately, the rain got very heavy and the thunder started when we were in the play area. We had to make a speedy exit. We missed having an ice cream so stopped at Kettering McDonalds for McFlurrys. We'd wanted to go out today for a walk with the older children riding their bikes. I've spent the day looking out the window and hoping to see some sunshine but it hasn't happened. Thank goodness for lots of arts and crafts materials as they always keep the children entertained. 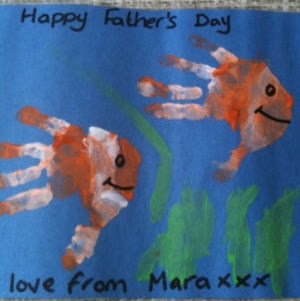 I'd been searching Pinterest (very addictive website) for Father's Day craft ideas. I showed these to the children and they chose want they wanted to make. This one was rather approriate as Dad keeps tropical fish. The children commented that this looks like a clown fish (Nemo). 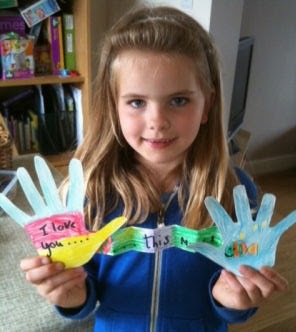 On the front hand it says, 'I love you.....' and the folded card opens up to say, '......this much'. Labels: Arts and Crafts, Days out, Father's Day, Newsletter items for parents of children in my care.